Reel Service Ltd is the largest semiconductor, electro-mechanical and mechanical component finishing service and materials provider in Europe providing complete component solutions for device manufacturers, distributors, contract assembly providers and end users. We have been providing quality component packaging & finishing solutions for 31 years. Continuous re-investment in state of-the-art, class-leading automated equipment maintains our competitive advantage in order to provide fast, efficient processing of customer's components with minimal lead-time. We believe that people are what makes a company, so customer's can rest-assured that their orders will be fulfilled by an experienced, well-trained, customer-focused workforce, the majority of whom have been with the company for over 15 years. Services provided include SMD, axial and radial component Tape & Reel; wafer level CSP/Die processing including mounting to film frame, dicing, inspection and tape and reel or waffle packing, device programming, laser marking, component preparation, lead conditioning and re-tinning. Material supplies are supported by our skilled in-house design and manufacturing teams who produce carrier tapes for standard components, and can provide custom designed tapes to customer requirements with minimal lead-time. We also supply additional materials to support device packaging needs including plastic reels, cover tape, trays, tubes and moisture protection products. Equipment Sales further compliments our Service and Material offerings providing customers with a wide range of Tape & Reel equipment, Component Counters, Vacuum Packaging equipment and Component Lead Cropping equipment. Quality is our main focus in achieving customer satisfaction through zero defect policies, operational excellence, people and state-of-the-art equipment. 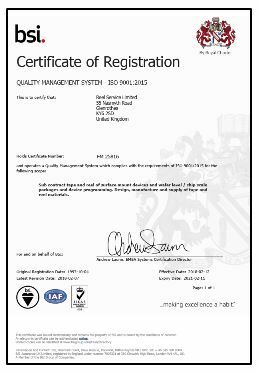 The facility operates in accordance with ISO 9001:2015 requirements. The combined capacity of Reel Service & Telford forms the world’s largest Tape & Reel Service provider with over 2,000 staff worldwide providing quality Tape & Reel packaging services of standard and odd-form components, Tape & Reel service of Wafer Level CSP/Die Products and IC Programming Services to OEMs, contract manufacturers and component distributors worldwide. Reel Service & Telford Group forms part of ASTI Holdings Limited (ASTI), a leading global technology company, listed on the mainboard of the Singapore Exchange. All facilities are ISO9001:2008/ISO9001:2015 certified. Deliver consistent, reliable quality services and materials on time. Being responsive to internal and external issues which influence our organisational performance. Effective monitoring, transparent operations and interaction with customers and staff. Ensuring the effective implementation of continual improvement of "Quality Management System" through periodic reviews. Developing employee motivation and skill through training, team work and resource management. ASTI Holdings Limited ("ASTI") ASTI Holdings Limited is a uniquely positioned technology group, comprising Backend Equipment Solutions & Technologies (BEST) and Distribution & Services. BEST is mainly engaged in the provision of solutions and technologies in the backend (i.e. assembly, test and finishing) arena of the semiconductor industry. The Distribution & Services Business is engaged mainly in the distribution of electronic components and products as well as the provision of semiconductor applications in consumer electronics, computer peripherals and communication solutions. Join Reel Service Ltd at the Southern Manufacturing & Electronics Show ‘The UK's LARGEST regional manufacturing technology, electronics and subcontracting exhibition’. The show takes place Feb 5th, 6th & 7th at the Farnborough International Exhibition and Conference Centre, a brand new 20,000m2 state-of-the art venue, offering superb modern facilities, easy access and free onsite parking. Come and join us to discuss what solutions Reel Service can offer for your backend tape & reel process requirements from our world-class portfolio of Service, Materials & Equipment offerings. Being showcased on the booth will be new world-class capability to process die from wafer to tape down to 0.2mm x 0.2mm. Also, new laser marking capacity offering in-line laser marking from tube to tube or from tube to tape. We look forward to meeting you at the show, visit us at booth F85 to discuss what Reel Service can offer you. Can't find the service you are looking for?